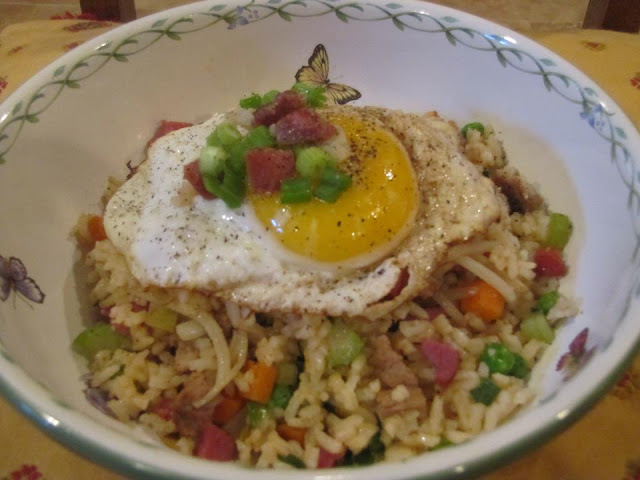 When I heard I was receiving tasso from Teet’s Food Store, I knew I wanted to make a great fried rice with it. Then I got a little crazy and decided to throw in a duck breast and some Slap Ya Mama Cajun seasoning. My husband was delighted as this was just the thing his family back in Kaplan, Louisiana would enjoy. Heat one tablespoon of sesame oil in a large non-stick skillet. Add the carrots and celery. Saute for 2 minutes. Add the green peas and saute for another minute. Add the green onions and bean sprouts and saute for 2 minutes. Remove from the heat. With a slotted spoon, remove all vegetables to a bowl, leaving the oil in the skillet. Add another tablespoon of oil to the skillet and heat. Add the rice and Slap Ya Mama seasoning, stirring and cooking for 3-4 minutes. Add the soy sauce and remaining sesame oil, stirring to coat the rice well. Mix in the duck breast and tasso. Fold the vegetables back in. Remove from the heat and divide between four bowls. Melt 2 teaspoons of butter in another non-stick skillet. Fry the eggs, 2 at a time, sunny sideup. Place one fried egg on top of the rice in each bowl. Sprinkle with pepper. Garnish with additional tasso and green onion. *If you like it really hot, throw in another teaspoon of Slap Ya Mama.